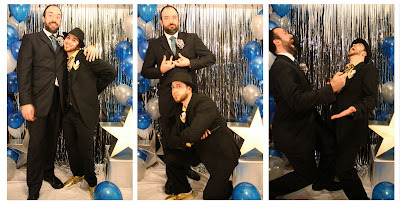 Sure, we had the music, and the dancing, the punch, and the decorations...But there was one prom staple that wasn't represented: The official prom portraits. 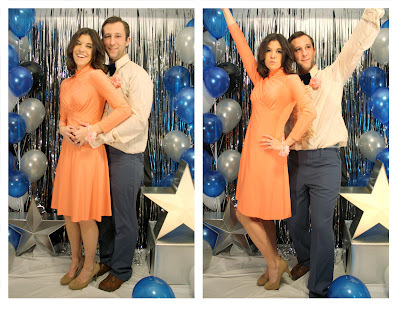 Everyone remembers the quintessential prom photo- A cheesy cheap backdrop (might involve some "greek" columns, or a leftover funeral home floral arrangement), a forced 45 degree angle to the camera pose, the guy standing behind the girl with his arms wrapped around her waist, cheesy awkward smiles. Priceless memories. Now I looooooove a photobooth for almost any occasion, and they're becoming a bit of a staple at any gathering I coordinate (yes...I've been holding out on you- there are a least two other photobooth parties that I haven't shared yet. Someday!) so I knew that we couldn't let this opportunity pass. It's too perfect! 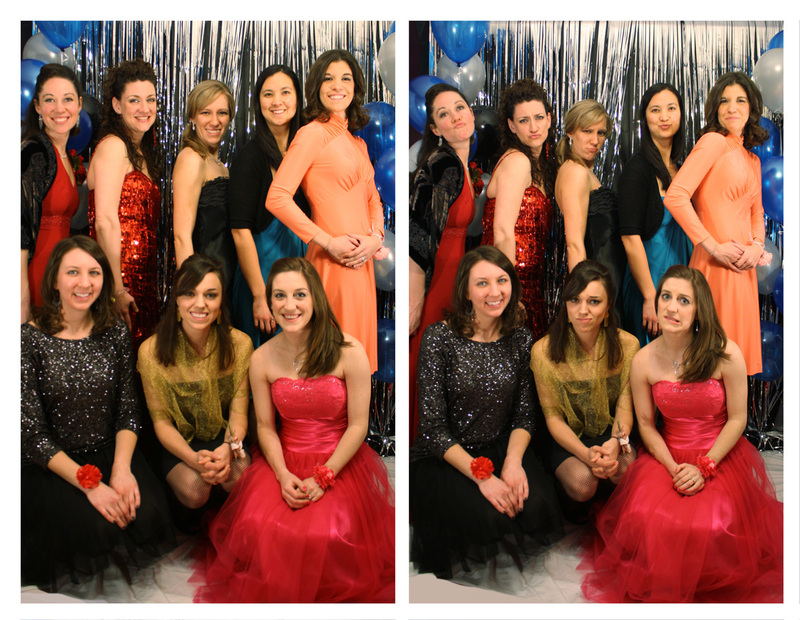 So finding a spot for the photobooth became my non-negotiable for the party. It was a little tricky- our house isn't exactly brimming with extra space (especially once we host out of town guests, create a dancefloor, set aside room for a bar etc. etc.) but I was nothing if not determined. Thus, the famed (ha!) third bedroom became our official photo spot. One of my friends Holly told me it looked exactly like her backdrop from her real prom. Best birthday present ever. My party mission was accomplished. Normally when I do a photobooth, I either take the pics myself, or people have to use the timer. But for Christmas this year I got a new gadget- a remote shutter release. That way we could just put the camera on a tripod and people could snap snap snap to their hearts content. And OH did we snap some pics. In the span of a few hours, we somehow managed to take 277 photos. Two hundred and seventy-seven photos. There were a couple people in the bunch that were more trigger happy than others, but when Dustin and I finally got our chance to play around with it at the end of the night, I found out how easy it was to get a little overzealous. 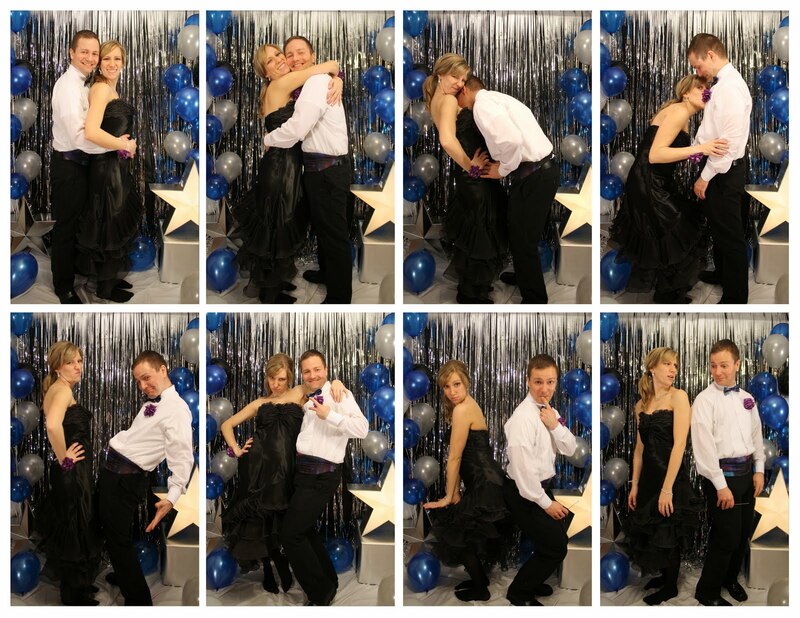 In the span of 2 minutes, we took some 39 pics. It was just too easy! And too fun! When I finally got to go through the photos the next day, I was dying laughing. There are just too many good ones! (I dare you to pick a fav...) It's tempting me to leave it up, and require people to take some shots every time they come over! SO awesome and SO realistic! I just wish you and Dustin hadn't become the lame party poopers that you are now that you have a baby... oh wait, you're 10 times more fun than me on a given Tuesday afternoon! Love you, party on! I thought I couldn't love your mom any more than I do...I was wrong. She's the best. 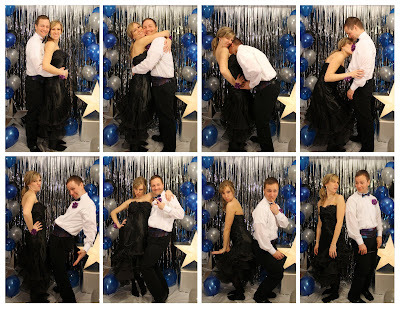 Wow, I totally want to go to prom again! I love the obligatory all-girls photo. Seriously, where did your Mom find that dress!?! It is awesome! Suzz- Don't worry...we're still lame 95% of the time. We just save up whatever's left of our coolness for big spectacles once a month or so. meg- it's still up! (imagine that) One more reason for you to stop by! Rachel- I say that at least once a week. Lindsey- my mom borrowed one of her friend's bridesmaids dresses from the 80's. She had about 4 dresses that were too die for, but I couldn't squeeze one thigh in, let alone actually zip them. So jealous of my mom's tiny little self! And anonymous- I will assume you are my dad. And if not I'll give him a shout out anyway- Thanks daddy for the helium tank!! You perfectly described and then replicated the stereotypical prom pictures of yore. And I'm assuming they probably haven't changed much over the years. I'm just amazed at how you throw these things together as if it were nothing! And with a baby in the house! Your birthday party looked like a ravishing success! I can't wait to see what you do when its Piper's turn to have a birthday! Is your mind already whirling with ideas?